A large number of the choir, augmented with singers from other UK choirs and a number of friends and relations visited Southern Ireland from 2nd to 6th June 2011. 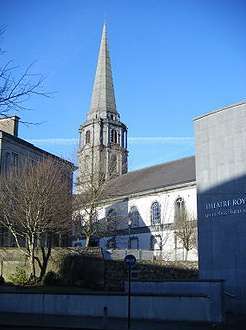 They performed “Elijah” in Waterford and in Wexford with the Wexford Sinfonia and international soloists. They also took part in a Mass in Waterford cathedral with Waterford Brass. All these events were well received. The group stayed in a golf resort near Rosslare and enjoyed some beautiful weather and a number of interesting excursions as well as very enjoyable (and appropriately lubricated) social occasions. Two coaches provided transport for most people. The musical programme was organised mostly by Nigel Wilkinson along with the Wexford Sinfonia who sponsored the” Elijah” concerts, and Waterford Brass. Margaret Hood and Fred Jones did a brilliant job of organising accommodation, transport and the complex logistics of a very enjoyable five-day musical holiday for well over 100 people. The brochure below is available for reference.